In this Arai Signet Q Helmet Review, we look at many qualities of this motorcycle helmet, not least why it is right up at number One for being the quietest. I have previously commented in other posts on this site that the C3 Pro by Schuberth is a class of its own. However, I am learning all the time and willing to be open minded about new technologies. I can say that the Arai Q Signet Motorcycle Helmet is certainly one of the quietest around. One thing to keep in mind that this helmet has been designed for people with large oval heads, thus allowing such people with a better fit. The Arai Signet Q helmet is based on an older design and style of the RX-Q that was based on the original collection signature that the company stopped making around 2004. This new design and technology is based on the original Signet brand, resulting in a new line of helmets. It is true that Arai have a reputation with engineering a logical ventilation system with all of their helmet designs. The air vents at the top and the chin are really the same as the previous Arai motorcycle helmet technologies. This has been done as it is a proven, tested and tried method that make sense and works well. The main purpose of this website or blog is to expose the best and quietest motorcycle helmets that will reduce noise. This helmet is very good with being quiet. However, there can be a little whistling noise from the vent at the top when you are travelling at high speeds. That being said you might have a different experience, since there are so many factors that come into play. One motorcyclist might be very pleased with low decibel levels but another may experience some issues with the noise. This is because the sound levels when wearing a helmet can depend on many things including how the helmet fits, how you ride and sit. Also wearing good quality ear plugs make a difference. I was chatting with someone the other day, whom has a long oval shape head and they found this helmet to be stellar as not may helmets fit such people correctly. He pointed out that the helmet was so comfortable that he would actually forget he was wearing it and would have no problem with it on all day, without any head or neck issues. This helmet has a reputation for being expensive but he found a good price on Amazon and now looks there for related accessories. He also said that normally he would want to try on the helmet for size but he could not find a dealer with the right fit. So checking on Amazon where they showed the sizes, he was able to make an accurate choice. In addition he also adored how the ventilation would keep his head cool in high temperatures. This helmet gives all the competition out there a serious run for their money. Which does not come cheap but then you get what you pay for, quality, the quietest, comfort, customization and safe. Yes, you get what you pay for. That is my philosophy. I always chose quality safety equipment every time and if digging more into your budget then so be it. If you have every been ejected from your bike then the full face helmet should be a mandatory choice. In my opinion a full face helmet should be required by law. 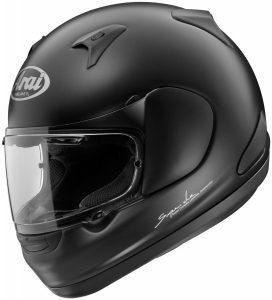 Anyway, you can check out the details of the Arai Signet Q Motorcycle Helmet on this page and where to get extra information.